The page viewer on the Isle of Wight County Press archive is powered by HTML5 or Flash and should work over a broad range of devices including smartphones and tablets. However, due to the size of the pages being viewed, less powerful or older devices may not be able to open pages in the viewer. The Isle of Wight County Press Archive is currently in beta mode. We are continuing to work to improve the site. The digital text OCR creates is not 100 per cent accurate. The accuracy depends on the quality of the original film, the style of the font, the size of the font and the design of the text on the page. The OCR scans all text on the page so you may be delivered results from adverts. On occasions there may be text on the page that has not been processed by the OCR, which means some reports may not come up through the search. Pages scanned from microfilm (1884-2005) will be a lower quality image than the pdf pages (2006-present). There may be occasions when the original print quality of a page has led to OCR problems. This could lead to problems searching those pages, despite them including the chosen keywords or search terms. Save where specifically indicated otherwise, this website and its contents is targeted only at UK residents and goods and services offered are available only to UK residents. Isle of Wight County Press accepts no liability in respect of the content of any third party material appearing on this site or in respect of the content of any other website to which this site may be linked from time to time. No metatags hyperlinks or other forms of linkage whatsoever to any other site may be imposed on the Isle of Wight County Press website without our express written consent. 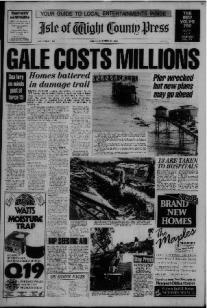 Isle of Wight County Press makes no warranty in respect of the contents of this Website and accepts no liability for any loss or damage whatsoever and however arising whether directly or indirectly as a result of access to and use of this website including without limitation acting or failing to act in reliance on any information contained herein. This site uses cookie technology but no personal information about the user is captured. For full information on cookies used on this site and how to delete them please click here. Any information voluntarily sent to this site will remain confidential and will not be passed to any third party or mailing lists. website as the source of the information by including such acknowledgement and the address of the Isle of Wight website (http://archive.iwcp.co.uk) in the copy of the material AND you inform the third party that the material may not be copied or reproduced in any way. You may not supply the material to any third party for commercial gain. No part of the Isle of Wight County Press website or the contents thereof maybe reproduced on or transmitted to or stored in any other website or other form of electronic retrieval system. You can only use the website for your own personal non-commercial use. You are not permitted to use the website or services for commercial, business or professional use or gain. Nor are you permitted to copy website content and share this with your friends, family, colleagues or any third party whether in physical hard copy, email or by other means. The index of the newspaper archives featured on the website can be searched for free, from any location. You have to register with us and be signed in to buy credits or a subscription. The contract between you and us for your use of newspaper archive begins when we send you a confirmation email, after receiving your order and accepting your payment. We offer different types of packages which give you access to our newspaper archives. You can find out more about the cost and length of the various subscription packages on our Prices page. We offer several packages. We have a subscription package which allows you unlimited access (subject to our Fair Usage Policy, outlined below) to the archive for the period of your package. Our three credit packages (20, 100 and 250 credits) give you a set number of credits. One credit gets used up when you view one page on the newspaper archives. Credits are only valid for a fixed time period and will expire if you don’t use them in this time – this is made clear on the payment page when you buy them. Pages can be viewed for up to six months after your initial viewing by logging in to your account. We have this in place purely for the (very rare) cases where people might abuse the service, and it is designed to keep the price of subscriptions as low as possible for our customers. If you view more than an average of 1000 pages per month through your subscription (calculated over a 3 month period) we reserve the right to contact you to establish the reason for the abnormally heavy use of the site. If you are just doing personal research we obviously don’t penalise you. However, should you continually breach the Fair Usage Policy terms following communication from us, we reserve the right to terminate your subscription. We constantly review the limit, based on average usage of the site by all users. We will continue to keep an eye on this and make adjustments as necessary. Many services today (such as broadband packages) have similar fair usage policies and they work in the same way as ours i.e they are designed to catch those who use the service excessively (which would drive up the price or reduce the quality of service for the majority of users). We hope this explains things - Please contact us if you have any further questions. If you buy a subscription or credits, you can contact us and cancel within seven days of receipt of our confirmation email and we will happily give you a full refund as long as you have not viewed any images of the newspaper archive. Please contact us if you want to use the website, newspaper archives or features for anything apart from your own research. archive are provided on an “as is” basis and are subject to change. We do not warrant or promise that the website will always be available or fully functional and reserve the right to withdraw the website or any newspaper archive at any time and will not be liable to you for any losses you might suffer. In the event we are notified that any of the material featured on the website potentially infringes the rights of any third party, we reserve the right to remove that content. The content will remain removed until we have conducted our investigation into the allegations made and may be permanently removed depending on the outcome of our investigation. labour disputes of whatever nature and for whatever cause arising including, but not limited to, work to rule, overtime, strikes and lockouts, then we will notify you of the circumstance and will be excused from the performance or the punctual performance as the case may be from the date of notice we provide you with for so long as such cause of prevention or delay continues. We will not be liable to you for any loss you may suffer during as a result of circumstances beyond our control. Content Providers: Each content provider of website content has the right to assert and enforce these provisions directly on its own behalf as a third party beneficiary.